13. What is a wrapper class in apex? Ans- A wrapper class is user defined type. We can set the properties of this type as per our requirement. similar to standard data types we can create collections of the wrapper class too. Wrapper class will be a inner class with a constructor in which the parameters are set. For example a wrapper could be combination of data contained in two different objects. A standard data type always allows to store data which of a single type, so we can say that whenever we have to collect data of different types we have to use wrapper class. 14. 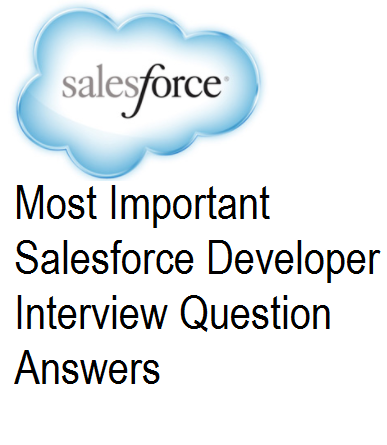 Reports in salesforce, what are the different types? The report can also be extracted as an excel sheet. 15. Dashboards in salesforce, what are the different types? 16. What is a report type? Ans - A report type is a skeleton over which you can build the report. It specify the structure of your report(Object relationship). Salesforce provides standard report types using which reports can be build. If the standard type does not suffice your requirement then we have to go for custom report type. It allows to build framework from which reports can be created. While building report type we need to select object and the relationship between objects to display in report. Which fields will be available for display can also be set. 17. What is a record type? Ans - Using record type we can set different page layouts, picklist values and business processes to different users. A profile can be set with a default record type or the user can be given option to select the record type before creating the record. Record type is can be created for both standard as well as custom objects. 18. What is trigger code? Ans - A trigger is a piece of code that executes on dml on a particular object. The code can be made to run on multiple events like update, insert, delete, upsert etc but a particular trigger code will only on single object. If multiple records initiate a trigger code then all of those records are available in trigger.new list. A trigger code should always be bulkified , that is it should be able to handle all the records.